What can a gamer glean from an invitation sent to reporters for Microsoft's 2011 E3 press briefing? Not much. What can that gamer glean from the stickers that came with it—especially if this gamer's sleuthing skills were recently enhanced by L.A. Noire? Not much more. You're looking at a set of stickers mailed received by reporters who will be attending Microsoft's E3 2011 press briefing. At that briefing, scheduled for 9am-11m PT on Monday, June 6, Microsoft's top men and women will be telling us all what they've got cooking in the land of Xbox 360 gaming for the next year or so. 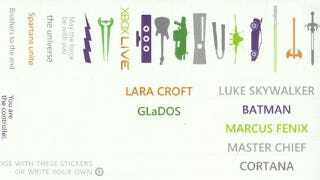 From these stickers, we can guess that they'll be proud to discuss, if compelled, the already-released Portal 2, the upcoming Tomb Raider, Batman and Gears of War games and even some Halo. It's not clear what that lightning bolt represents, but it sure doesn't signal the immediate return of Joanna Dark or Blinx The Time Sweeper. Do we at least have a sign here that they might admit that their Kinect Star Wars game still exists?